You have pined your entire life for a poster featuring a 1989 Toyota Corolla All-Trac. But you also have a thing, weirdly, for the Scion xD, a car nobody ever loved. And a Lexus SC300. And a Toyota Prius Prime. And a brand-spanking-new Toyota 4Runner TRD Pro. But no one was able to give you all of these things, on a poster, together. Until now. And a Toyota Previa, because why not. Somehow, some way, Zayman truly captured the soul of a Previa. That thing looks exactly like every single Previa I have ever seen. All of them come in that color, even when they are not in that color. And faced with his new website, ImportArchive.com, Zayman has begun an even larger quest. 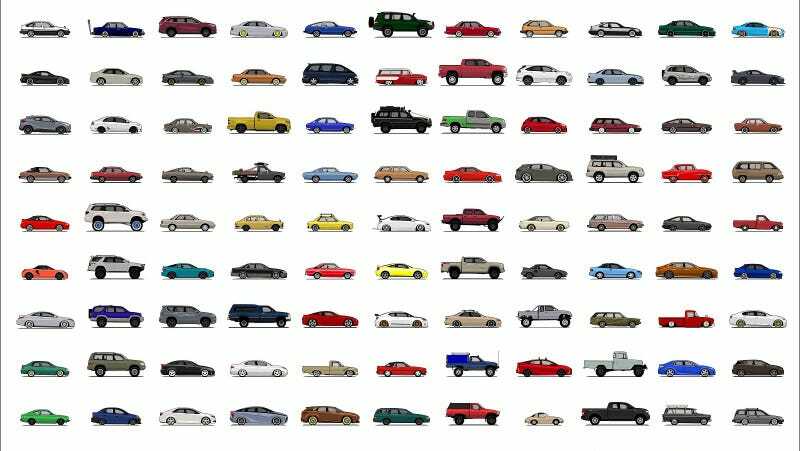 He aims to illustrate every single Japanese car ever sold in the U.S.
He’s uploaded about 2,200 brochures so far, has another 1,000 brochures in his possession that he’s in the process of uploading, and needs about another 2,200 brochures to complete it. To that end, he’s hoping to find other people who might have a couple brochures in their own collections to help him complete the archive. It’s not just brochures, though. It’s spec sheets. Paint codes. Even every single TV ad. The Import Archive basically seeks to be the world’s largest Japanese car reference library. And now that he’s done drawing Toyotas, the automotive drawing obsession doesn’t stop. Zayman has moved on to drawing every single Nissan, Datsun, and Infiniti ever sold in the U.S. He’s gone nine of them down, and has a mere 177 to go. Plus, he’ll even draw your own personal car, if you want. Want the big Toyota poster, though? You can get it right here.